A QS1,500 rated event for men and women, the Senegal Pro attracted nearly 70 international competitors with Timothee Bisso (FRA) and Nadia Erostarbe (EUK) claiming commanding victories in the finals against Aboubakar Bouaouda (MAR) and Emily Nishimoto (JPN) respectively in one metre waves at Surfer Paradise in Dakar. Stop No. 1 on the 2019 WSL Africa regional QS circuit was graced with beautiful conditions and great performances by a talented group of international athletes as well as a handful Senegalese surfers. Maree was in form throughout the event, winning his four-man Round of 32 and Round of 16 heats and then defeating compatriot Dylan Lightfoot (Jeffreys Bay) in their man-on-man quarter-final. Maree was narrowly outpointed by eventual runner-up Bouaouda in their semi-final encounter but his haul of 840 points saw the South African leapfrog 239 places up the QS rankings list to No. 146 and he takes the early lead on the WSL Africa regional leaderboard. The Senegal Pro pres. by BKS ran from March 27-30, 2019 at Surfer Paradise, Dakar – Senegal. For all results, photos, video highlights and press releases, log on to worldsurfleague.com. Completed in bumpy one metre right-breaking waves at Avoca Beach in New South Wales, the QS3,000 rated event saw compatriot Dylan Lightfoot finish fifth after reaching the quarter-finals and fellow Jeffreys Bay surfer Matt McGillivray match Masencamp’s result with equal ninth place. Bianca Buitendag (Victoria Bay) made it an unprecedented four South Africans in the Top 10 at a QS3,000 rated event in Australia when she claimed fifth place in the Sisstrevolution Central Coast Pro women’s event run in conjunction with the men’s event. Masencamp continued the phenomenal run of WSL event results that has seen the 19-year-old from Strand in the Western Cape dominate the WSL Africa regional rankings for the past two years, claiming the Junior Men’s crown in 2017 and following that up with the Open Men’s title last year. An outstanding fifth place finish in his first event of the season, the QS6,000 Oi Hang Loose Pro in Brazil last week where he was up against many of the world’s best surfers, and his ninth place at Avoca today has seen Masencamp accumulate 3,550 points and he is the highest rated South African on the international QS rankings. McGillivray, the country’s highest placed surfer in the 2018 yearend rankings where he finished No. 30, earned 900 points at Avoca which along with the 1,260 for his quarter-final result in Israel earlier this year, saw the 21-year-old leapfrog from No. 45 to 23rd in the current rankings. Lightfoot enters the 2019 rankings in 63rd place thanks to his confidence-boosting run to the quarters in his first event of the year, while Jake Elkington (Kommetjie) is the only other South African in Top 100 after his results in Israel and then the Canary Islands combined see the Capetonian occupying 92nd spot. Buitendag, who was ranked as high as No. 4 on the elite Women’s WSL CT at the end of 2015 before a longstanding back injury saw her slide down the rankings, started her 2019 challenge strongly by advancing through three rounds of competition before she was ousted by eventual event winner Sage Erickson (USA). The South African contingent in Australia will be joined by Michael February (Cape Town), Beyrick de Vries (uMhlanga) and Slade Prestwich (Durban) for back-to-back QS6,000 rated events at Merewether Beach in Newcastle and Manly Beach in Sydney later this month. Full results, news, images and video footage from Avoca are available at www.worldsurfleague.com and on the WSL App. Matt McGillivray launched his 2019 World Surf League (WSL) Qualifying Series (QS) campaign with a fifth place finish on Friday in the first event of the season, the QS3,000 rated Seat Pro Netanya in Israel. The 21-year-old from Jeffreys Bay, who won the corresponding event in Israel last year, narrowly advanced through three rounds where he finished second in each of his four-man heats, before he was ousted in his man-on-man quarter-final encounter with eventual event runner-up Tristan Guilbaud (FRA). The event was won by Eithan Osborne (USA) who defeated Guilbaud in the inconsistent 1 -1.5 metre waves to clinch his maiden QS event title. South Africa’s Liam de Villiers (Richards Bay) finished 65th after placing third in his Round 2 match-up while Jake Elkington (Kommetjie) won his Round 3 clash but bowed out in equal 25th spot overall after placing fourth in his Round 4 clash. McGillivray, ranked No.30 in the QS rankings at the end of 2018, the highest by a South African, is set for a busy first three months of the season that will see him circle the globe competing in events in Hawaii, Brazil and Australia. He has entered the QS3,000 Volcom Pipe Pro at Pipeline in Hawaii, which starts on 29 January and runs until 10 February, where he will be joined by compatriot Jordy Maree (Kalk Bay). McGillivray then jets to the island of Fernando do Noronha, off the coast of Brazil, for the QS6,000 Hang Loose Pro (19-24 Feb) which will also feature WSL Africa 2018 men’s champion Adin Masencamp (Strand). Three days later the pair are due to get their campaigns underway in the QS3,000 Vissla Central Coast Pro at Avoca, Australia (27 Feb – 4 Mar) before participating in the QS6,000 Burton Automotive Pro at Newcastle, Australia, (11-17 March) where they will be joined by Beyrick de Vries (uMhlanga). South Africans enjoyed one of the country’s best ever years on the international surfing stage in 2018 with Steven Sawyer (Jeffreys Bay) clinching the WSL World Longboard Surfing title, Grant ‘Twig’ Baker (Durban) heading the WSL Big Wave Tour rankings (with just one event to go), Jordy Smith (Durban) finishing fourth in chase for the WSL Men’s World Title and a record-setting eight South African surfers ranked in the Top 100 of the yearend QS rankings. These annual rankings are based on each surfer’s best five results after 64 events rated from QS1,000 to QS10,000 on all five continents, which in 2018 featured a total of 1384 competitors. The top 10 in the rankings automatically qualify for the following year’s elite Championship Tour (CT) and also for starts in the limited fields in the biggest QS events for the first half of 2019. BANZAI PIPELINE, Oahu/Hawaii (Monday, December 17, 2018) – Gabriel Medina (BRA) has won the 2018 World Surf League (WSL) Title by claiming victory at the Billabong Pipe Masters in Memory of Andy Irons at Pipeline in Hawaii in epic 2 to 3 metre (6-10 foot) barrels. 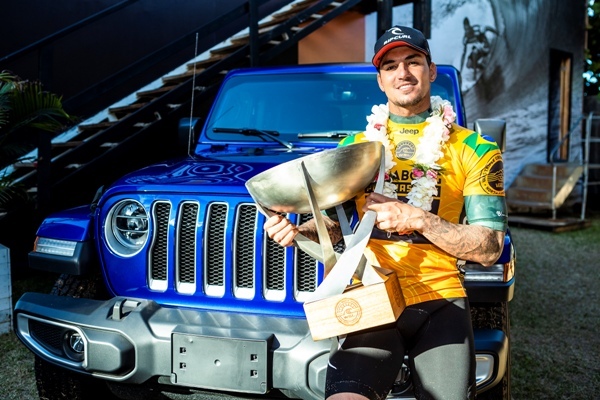 Medina, 23, made history in 2014 as the first Brazilian to win a WSL World Title and has now cemented himself into the annals of surfing history with a second crown and his first event win at Pipeline..
“All my heroes have won this contest,” Medina said. “I’m stoked to be a part of everything here. Winning this event is a little different. I really wanted this one, and I worked really hard for this one so I’m so happy. That was a good final. Julian (Wilson) is the toughest competitor to go up against so I’m lucky I got two good waves. He won in a final against me a few years ago and I got this one, so it feels good. Medina’s road to the Title in 2018 was bumpy at first but then the Brazilian switched gears mid-season and claimed back-to-back wins in Tahiti and at the inaugural Surf Ranch Pro. He continued to impress as one of the most consistent surfers through the European leg with two equal-third places and arrived in Hawaii with a 4,740-point lead over his nearest rival Julian Wilson (AUS). 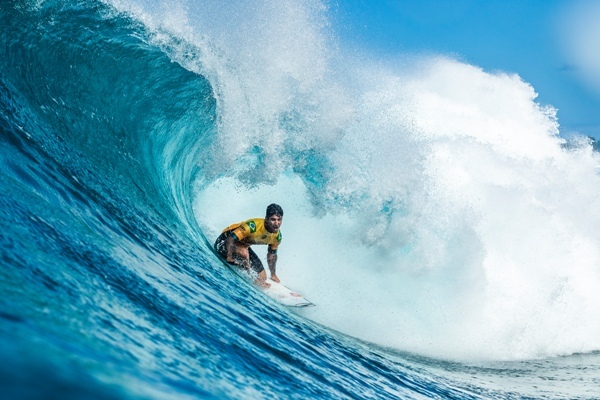 The rest is history as Medina reached the final at Pipeline to claim his second WSL Title. “It’s hard to believe, this year was a long and intense year,” Medina continued. “Everyone put in a lot of hard work and this is the day. I’m so happy and thankful. To have the opportunity to travel the world with family and friends and to do what I love…it’s the most fun job in the whole world. This is such a special day for me and I’m so happy to do it again. In 2014, the then-20-year-old Medina wrote a new page in surfing’s history books as the first Brazilian to win a WSL World Title, in an exciting year-long race against Mick Fanning (AUS), John John Florence (HAW) and Kelly Slater (USA). It was also the year the phenomenal surfer from Maresias shut down all criticism about his bigger-surf prowess by winning two of the most prestigious events in Fiji and Tahiti, finishing off the season with a runner-up at Pipeline. It took two more years for the phenomenon to find his competitive rhythm, winning his first World Title in 2014. His success inspired compatriot Adriano de Souza (BRA), who went on to win Brazil’s second World Title the following season. 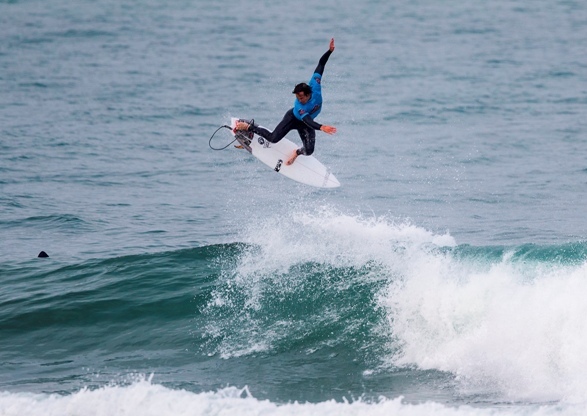 In 2018, Brazilians Italo Ferreira, Filipe Toledo, Willian Cardoso, and Medina were collectively responsible for nine out of 11 CT event wins, with Wilson claiming the other two. The Pipeline Masters final was a clash of epic proportions between the two strongest surfers in the field Medina and Wilson. Both surfers threaded lefts and rights to put big scores on the board, but ultimately it was Medina who took out the final matchup of the year and claimed the prestigious Billabong Pipe Masters title for the first time in his career. Wilson capped off an incredibly consistent season where he claimed two event victories in Australia and France, two additional final appearances and another four strong results to finish second overall for the first time in his career. On finals day at Pipeline, the Australian needed to make the final for a shot at bringing the World Title home, and he delivered with inspiring performances, most notably facing the 11x World Champion Slater in the semi-finals. Unfortunately, Medina reaching the final left no chance for Wilson to lift surfing’s most prestigious trophy. “I’m so thankful for the incredible waves and the locals for allowing us to surf here,” Wilson said. “The hopes and dreams of the World Title were there today and it’s been an emotional one. It came down to the final heat of the year and I’m ready to do it again next year. I put my heart out there and gave it my all, but Medina deservedly took the title and I’m so happy for him. South Africa’s Jordy Smith delivered his career-best Pipeline result, finishing third in the event after a narrow defeat by eventual winner Medina in their semi-final duel. The lead changed hands several times during the 30 minute encounter with both surfers posting their best scores on the rights at Backdoor. Earlier in the day Smith had seen off the challenges of Conner Coffin (USA) and wildcard Ryan Callinan (AUS) in Round 4 and Sebastian Zietz (HAW) in their quarter-final clash to get into contention to become the first South African to win the Vans Triple Crown of Surfing title (after Heather Clark in 2001) if he could reach the final. The big Durbanite is a perennial world title contender and his third place result at Pipe saw him move up one spot in the rankings to end 2018 as the World No. 5. Jesse Mendes (BRA) won the VANS Triple Crown of Surfing title following Jordy Smith’s (ZAF) semi-final loss to Medina. Mendes collected a fifth place at Haleiwa, a runner-up in Sunset and a 9th at the Billabong Pipe Masters. 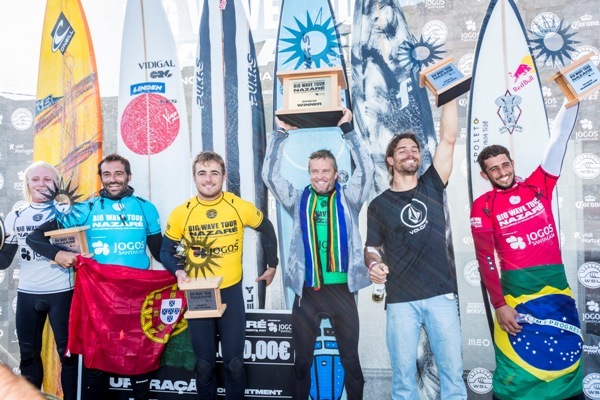 Mendes is only the second surfer from Brazil to claim the prestigious award after Medina in 2015. The break before the men’s final saw 3x WSL Women’s World Champion Carissa Moore (HAW) take on compatriots Alessa Quizon (HAW), Coco Ho (HAW) and Zoe McDougall (HAW) in a women’s invitational heat. World No. 11 Ho dominated with radical manoeuvres on rights at Backdoor and she took out the win ahead of Moore in second, Quizon and McDougall placing 3rd and 4th respectfully. Earlier in the day, Joel Parkinson (AUS) surfed the last heat of his professional career on the Championship Tour, defeated by Yago Dora (BRA) and Wilson in Round 4. 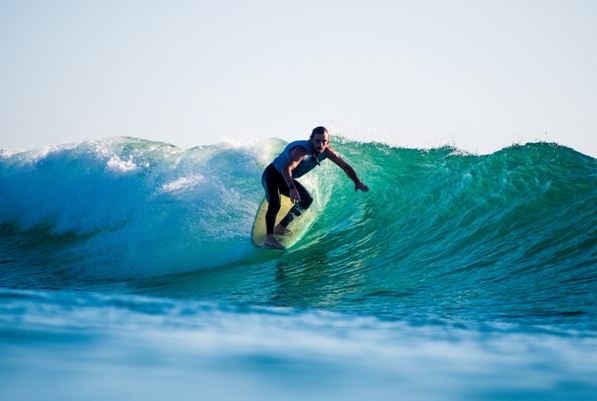 The 37-year-old Australian, who claimed the World Title in 2012, spent 18 seasons among the world’s best surfers and received many accolades, being regarded as the most stylish surfer on tour. For highlights from the Billabong Pipe Masters in Memory of Andy Irons, please visit WorldSurfLeague.com. 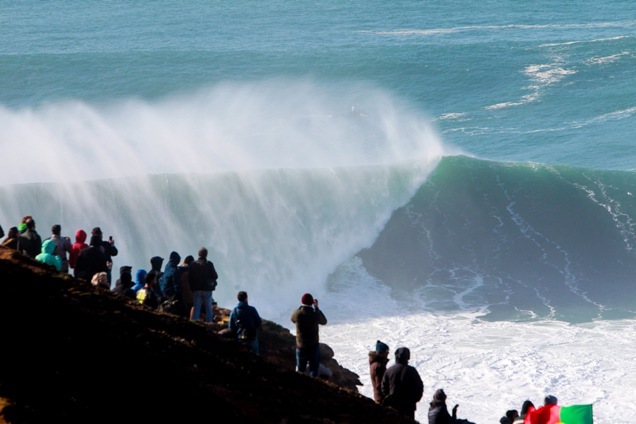 Grant “Twig” Baker Wins Nazare Challenge in Giant Waves in Portugal! South African Grant ‘Twig’ Baker today won the Nazare Challenge, the first event on the 2018 / 19 World Surf League (WSL) Big Wave Tour (BWT), in huge 8 to 13 metre (25 to 40 foot) waves at Praia do Norte (North Beach), Nazare in Portugal. Baker, the 2013 and 2016 WSL BWT world champion and at 45 the oldest competitor in the event, claimed the fifth BWT event title of his storied career and he now holds the early lead in this year’s BWT rankings. “I’m really happy to win here at Nazare,” said Baker on exiting the water. “I have spent the last six weeks here with my family, Kate and Billi, surfing every day in one foot to 20 foot (0.5 to 6 metre) waves and it has certainly helped me know more about the break. The Durbanite squeaked through his Round 1 and Semi-final heats, placing third in each and in danger of being eliminated from the event if he had been overtaken as the time ran out in the 45 minute encounters. Baker caught the first ride in the 60 minute final, earning a score of 5.33 out of 10, and he followed that up almost immediately with a 4.93. With two scores in his pocket he had the luxury of being able to position himself to wait for the biggest waves to arrive while the other five finalists needed to chase around the break trying to record their counting scores. Despite replacing his 4.93 with 6.07, Baker was overtaken by hard-charging Portuguese local Naxto Gonzalez, who had posted the only perfect 10-point score of the event for a ride deep inside an enormous 10 metre tube in the semis, and defending event champion and eventual 2018 event runner-up Lucas ‘Chombo’ Chianca (BRA). With 10 minutes remaining the horizon went black as a set of massive waves came thundering through ultra-deep underwater canyon that refracts the world’s biggest rideable waves into the surf zone at Nazare. Baker held his nerve and as the biggest wave of the day was about to break on his head he swung around, paddled in and dropped down the face. Holding his line as the wall of water estimated at 13 metres (40 foot) in height by the commentators towered over him, Baker guided himself around the tons of crushing white-water and onto the shoulder, raising his arms in exultation as he cut-out over the back of the wave. The judges awarded Baker 8.67, the highest scoring ride of the final, and when he added a 7.70 in the dying minutes, the title was his. The Nazare Challenge was given a Silver coefficient by BWT Commissioner Mike Parsons based on the waves being in the 35 foot (12 metre) range which means that Baker earns 11,000 points on the rankings, 10% more than the10,000 points awarded to the winner of a Bronze coefficient event. 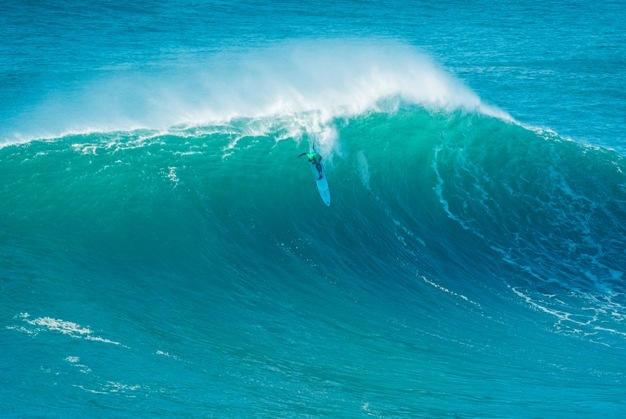 The 2018/2019 Big Wave Tour (BWT) hosts three events: the Nazaré Challenge, the Jaws Challenge, and the Mavericks Challenge. All holding periods for this season are now open and will await the biggest waves until the season’s close on March 31, 2019. For the Jaws Challenge and Mavericks Challenge, the world’s best male and female big wave surfers will prepare for conditions that will produce waves in the 30-to-60-foot range. Once the decision is made to run the event, a “Green Alert” is issued and competitors will have 48 hours’ notice to be ready to compete. The WSL Big Wave Tour is proudly supported by Surfline, and Corona, with special thanks to Nazaré Challenge partners Jogos Santa Casa, Visit Portugal, Portuguese Waves, The City of Nazaré, MEO, Hertz, and Praia do Norte. Former two-time world big wave champion Grant ‘Twiggy’ Baker is ready to take on the giant surf at Praia do Norte (North Beach) in Portugal on Friday after the Nazare Challenge was given the Green Light to run at the home of the biggest wave ever surfed. The first of three events on the 2018 / 19 World Surf League (WSL) Big Wave Tour (BWT) schedule takes place at Nazare, a Portuguese town that has embraced big wave surfing, and Baker has spent considerable time there acclimatising himself and fine-tuning his equipment after finishing fifth in last season’s edition of the event. “I’ve been in Europe for 6 weeks with the family getting ready for the event, surfing Nazare in all different conditions, so I’ve put in the time to give myself the best possible chance to do well,” said Baker after hearing the event had been called ON for Friday. “I have some great boards over here and I’ve been working on my positioning in the lineup and have a better idea of what a good wave looks like out there. “Hopefully I can use that to catch the best waves in the middle of the peak and surf them to the best of my ability. Defending event winner Lucas “Chumbo” Chianca (BRA), reigning Big Wave Tour champion Billy Kemper (HAW), renowned waterman Kai Lenny (HAW) and Nathan Florence (USA) have been the standouts lately and I’m looking forward to competing against the hungry youngsters,” commented Baker, who at 45 is the oldest competitor in the field. A developing storm near Greenland is expected to produce a strong WNW swell for Friday. Confidence is medium to high for a swell to provide good surf throughout the day. We expect to see wave face size in the 20-30’ range (through the day on Friday), with the very largest sets of the morning up to 35’. While this isn’t a giant swell, especially by Nazare standards, local wind and conditions look about as good as it gets on Friday: light+ offshore ESE wind through the morning, trending more SE (still offshore) for the early afternoon hours, generally below 10 knots. Furthermore, the two previous days (Wednesday-Thursday) are also expected to see light offshore wind and small swell, which should mean conditions are extra clean on Friday. According to Baker the swell is likely to get even bigger over the weekend and he feels that the world record wave height of 80 feet (23.77 meters), set by Rodrigo Koxa (BRA) when he was towed into a wave by a jetski at Nazare recently, may even be broken. The BWT events only allow waves to be caught paddling in with arm-strength although there will be numerous jetskis in the surf zone to conduct rescue and safety duties. “There is a huge swell coming this weekend that will probably see the World tow record broken,” said Baker, the 2013 and 2017 BWT champion. “We have to work around this swell and the event has been called for the beginning of it all. Hopefully we get some giant waves with epic conditions and Nazare at its best for paddle surfing. The WSL Nazaré Challenge will be broadcast LIVE on WorldSurfLeague.com and the WSL’s Facebook page starting at approximately 9.30 am South African time. The 2018/2019 Big Wave Tour hosts three events: the Nazaré Challenge, the Jaws Challenge, and the Mavericks Challenge. All holding periods for this season are now open and will await the biggest waves until the season’s close on March 31, 2019. For the Jaws Challenge and Mavericks Challenge, the world’s best male and female big wave surfers will prepare for conditions that will produce waves in the 30-to-60-foot range. Once the decision is made to run the event, a “Green Alert” is issued and competitors will have 48 hours’ notice to be ready to compete.